You cut your own stones? HBS Guy wrote: Wish Lefty would log on again. He would know. Opals are cut as cabochons, no facetted. Opal is a form of silicate so not overly hard, unlike sapphires. [quote="HBS Guy"]Wish Lefty would log on again. He would know. Opals are cut as cabochons, no facetted. Wish Lefty would log on again. He would know. Opals are cut as cabochons, no facetted. pinkeye wrote: umm yeah well anyone know about opals? Lefty might but he hasn’t logged on for ages. Bit worried actually. umm yeah well anyone know about opals? 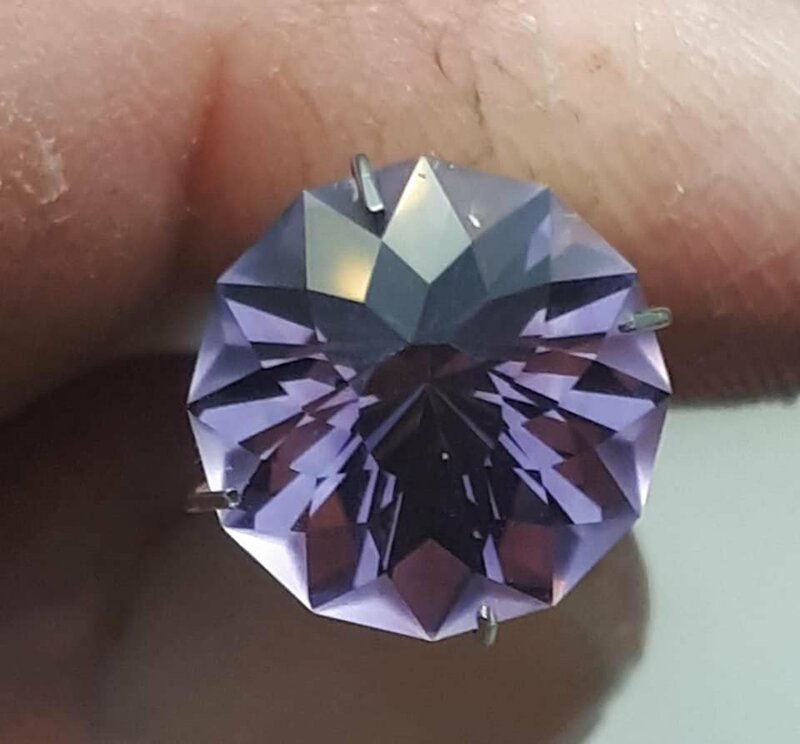 Lefty, who hasn’t posted for a while, somewhat concerning, is a dab hand at gem cutting (and finding gems!) knows the precautions to take—there is always water running when polishing so no dust. Could be fun but take seriously the necessary precautions concerning breathing in the dust you produce. If I had that gear to play with I’d explore working with Sunstone and Labradorite. Yeah, photo taking is a work in progress - though all of those photos look much clearer at half that size. All those stones are actually quartz - amethyst and citrine. 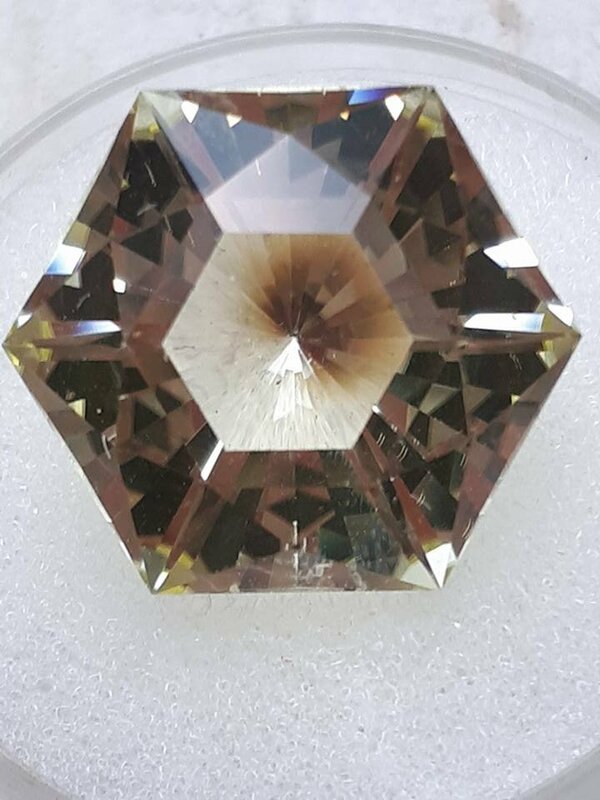 The second photo is the citrine which is a more noticable shade of yellow in person. The five-sided one below it is actually a pale Rose-de-France coloured amethyst but the design creates a very bright stone which throws so bright white light refelection that it swamps out the colour, although it is easily visible to the human eye - the camera has difficulty picking it up. Finished a nice sapphire last night, same thing - even though the colour is very deep the eye can still readily discern many flashes of green but the camera sees only a black stone. You probably need a tripod and a remote switch to take a photo with no blur from the camera moving. Maybe a suitable light behind the stone? Is that a smoky quartz in the second photo? 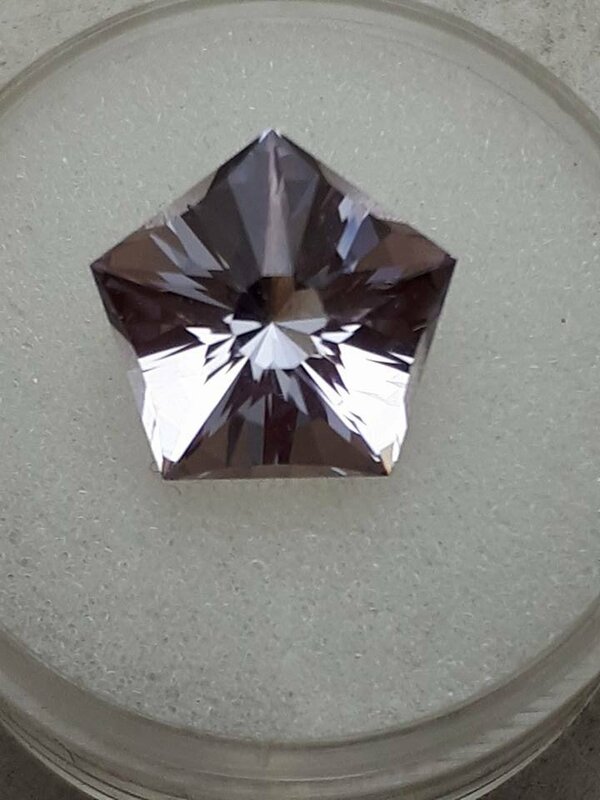 Taking photos of faceted stones that are sharp, clear and do the stone justice is bloody hard! That looks really neat! If he doesn’t like it he must be an idiot—is your client Barnaby Joyce by any chance? It's difficult to make promises in advance as to how something will turn out when you work with natural material. 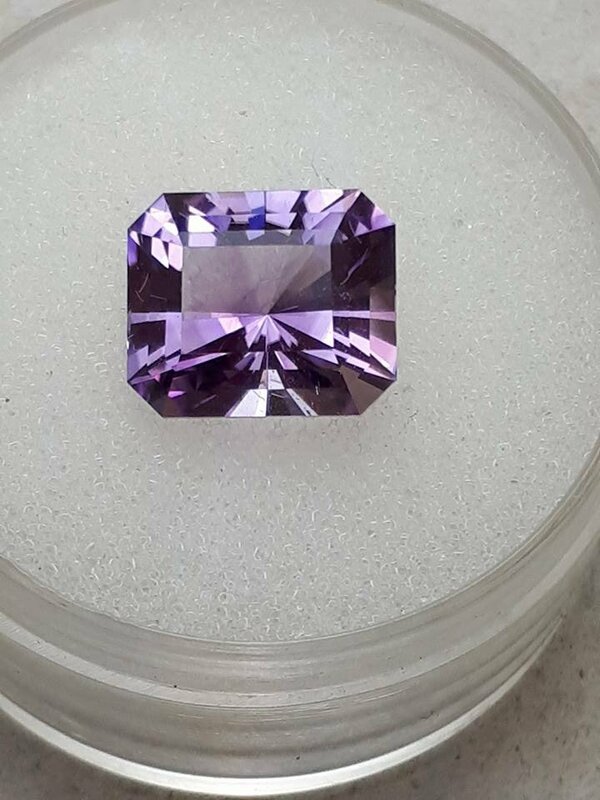 The colour is often not evenly distributed throughout the stone and it's often a toss up between retaining the strongest colour and getting a good,clean stone free of any visible flaws. Nah, got a problem with inner ear, balance gone, nausea, get a head CT scan tomorrow. Did you give it a go? Just a little dab in an inconspicuous spot to test? Yeah, should be ok then, just be sure to keep the metal hub of the tool away from the item you're polishing. At the club they used a dilute sulphuric acid based "pickle" as it's called, for cleaning silver after soldering, which coats it in oxidisation. A number of jewellery-making blogs said all they use is household vinegar and table salt at the rate of 2 tablespoons of salt dissolved in 1 cup of vinegar. This is all I've used since I started mucking around with jewellery making and I can tell you that it works almost as fast and every bit as effectively as commercial solutions - with the added bonus that the ingredients are non-toxic and as cheap as chips! Copper develops the most unbelievably thick crust of oxides when you solder it but the salt and vinegar pickle strips it back to shiny metal in no time. I've found it works most effectively when it's about the temperature of a hot cuppa and you immerse the entire piece but it does still work when cold, just takes longer. I think you could paint the solution over the piece with a paintbrush, might have to do it a couple of times, rinse and quick scrub but I think it would work without much effort at all. Just be sure to wash you hands thoroughly, the salt and vinegar will be toxic after cleaning the brass and having absorbed the metal oxides from it. I think the phosphoric acid would work as well, just keep your eye on it to make sure it doens't start etching the metal. Copper develops the most unbelievably thick crust of oxides when you solder it but the salt and vinegar pickle strips it back to shiny metal in no time. I've found it works most effectively when it's about the temperature of a hot cuppa and you immerse the entire piece but it does still work when cold, just takes longer. I think you could paint the solution over the piece with a paintbrush, might have to do it a couple of times, rinse and quick scrub but I think it would work without much effort at all. Just be sure to wash you hands thoroughly, the salt and vinegar [i]will[/i] be toxic after cleaning the brass and having absorbed the metal oxides from it. Ahahahaha yeah, nah this wheel is like 10cm diameter, will be OK. The brass polishing place first soaks the piece in acid and that should get rid of the green verdigris I reckon. Might try vinegar (on the jardiniere.) Lots of articles on how to clean brass, comes down to making a paste of vinegar and baking powder. I think the acid in the vinegar does the work of getting rid of corrosion, the baking powder acts as mild abrasive. Put the paste on, working it in, leave for 20 minutes, rinse, buff dry. I think you should be able to get a variety of polishing fittings to go in a cordless drill. My flex-shaft (a Dremel with a long, flexible drive shaft and a light hand piece used for carving and jewellery work) takes heaps of fittings that can get right down into nooks and crannies. Not sure how small they make them for drills but a regular Dremel even without a flex-shaft is a very handy little tool for multiple applications around the house. Probably can rig up something to go in a drill that will get right down into tight spots. Actually, some don't contain particles big enough to be really considered what we would call an abrasive in the usual sense. With the oxide polishes such as alumina, cerium, tin etc there is continual argument as to how the polishing action really occurs. 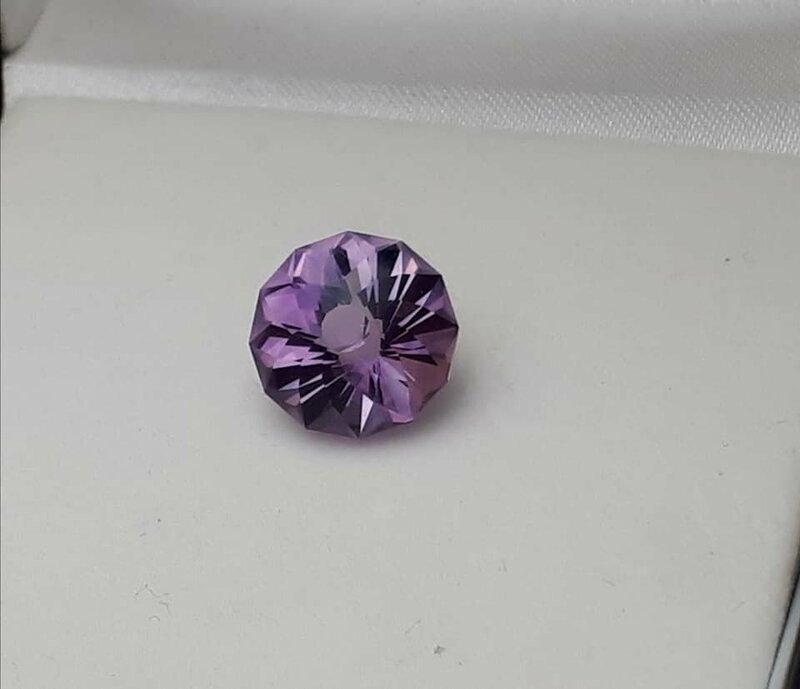 No one has yet invented a machine that can allow us to see what is happening to a surface (of a gemstone) during polishing and the same oxide of two very different particle sizes can produce a very similar looking polish. While there has to be at least some abrasive action from the polish particles, it appears that in many cases the oxide + friction creates a chemical reaction and an infitismally-thin layer at the surface "melts and flows" for want of a better term. British scientist Sir George Beilby discovered this property in gemstone polishing in the 1930's, with American scientist Earnest Fairbanks backing this up later on. Since then, many people have tried to discredit the notion of polishing creating a "Beilby layer". However, the issue just keeps on coming back up because it is obvious to anyone who has been involved in lapidary long enough that there is indeed something there. 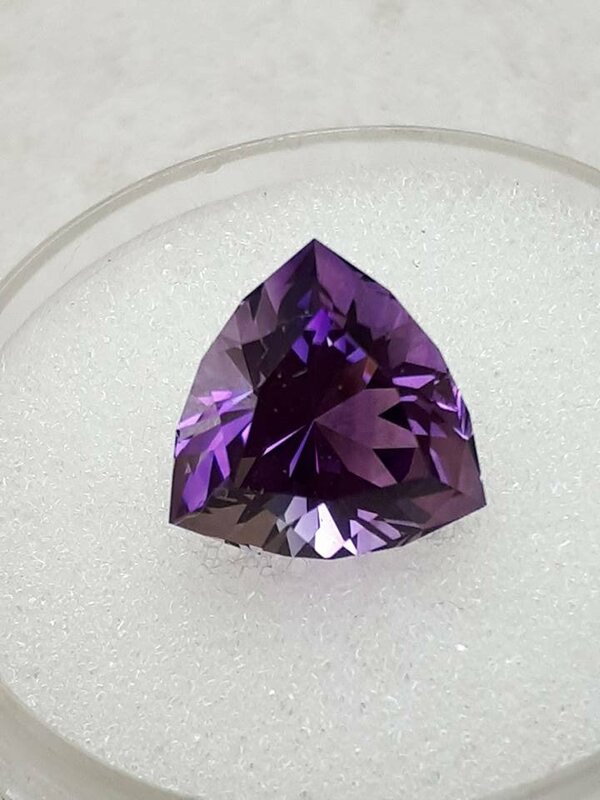 Someone was complaining about it a little while ago on one of the lapidary forums, trying to re-polish a stone for a customer and having trouble because the already-polished surface simply would not behave like a raw, fine cut surface ready for it's first polishing. While there was much to-ing and fro-ing, in the end nearly everyone agreed that polishing seems to create a surface layer with characteristics that are slightly - but noticably enough to cause headaches - different from the underlying material. This isn't really what we would expect if the polish was entirely the result of ultra-fine abrasion by inert particles. For myself, I will happily claim to have actually seen the so-called Beilby layer, through very powerful loupes, much more powerful than I normally use for lapidary work (dunno why I bought what amounts to a low-powered, hand-held microscope, way in excess of what is needed for faceting but anyway I did). Just like Beilby, who noted a very particular scratch pattern, polished the surface with oxide until a perfect polish was achieved and scratches no longer visible even with magnification -and then etching the surface with acids and recovering the identical scratch pattern - I have actually seen similar. Seen a particular scratch pattern left by the fine cutting lap and polished the surface with cerium oxide until the scratches were entirely gone. But on close examination with said very powerful loupe, at particualr angles the exact same scratch pattern was still just visible but the scratches now had the appearance of having been "filled in with liquid glass". It really didn't appear that it was just the last vestiges of the original scratches that hadn't quite been removed, there definately seemed to be something filling in the scratches, as though polishing had created an amorphous layer - similar to glass or opal - which had flowed into the scratches and filled them. Just thought I'd chuck that out there - this isn't really an issue with metal polishing, there's only two grades in jewellery polishing and both probably do function as fine abrasive (though a precious metal polish called "Rouge" in the jewellery trade is in fact iron oxide). Btw, you can buy all of this stuff for not that much from Bunnings. I have a cheapie Chinese made bench grinder from Bunnings - think it was about $60 - took the grinding wheels off it and replaced them with coarse buff on one side charged with "Tripoli" which is an aggressive pre-polish for metal and the other a soft muslin buff charged with Rouge for the final polish. The adaptors for screwing on the buffs, the polishing compounds - all available from Bunnings. I think this set up would polish a significantly large brass, bronze, silver or copper item very quickly. It's way more than what I actually need for little items like rings. True, you still won't get right into small, tight corners but if you have a lot or ornamental metalware, it might be worth looking into. While there has to be at least [i]some[/i] abrasive action from the polish particles, it appears that in many cases the oxide + friction creates a [i]chemical reaction[/i] and an infitismally-thin layer at the surface "melts and flows" for want of a better term. British scientist Sir George Beilby discovered this property in gemstone polishing in the 1930's, with American scientist Earnest Fairbanks backing this up later on. Since then, many people have tried to discredit the notion of polishing creating a "Beilby layer". However, the issue just keeps on coming back up because it is obvious to anyone who has been involved in lapidary long enough that there is indeed [i]something[/i] there. 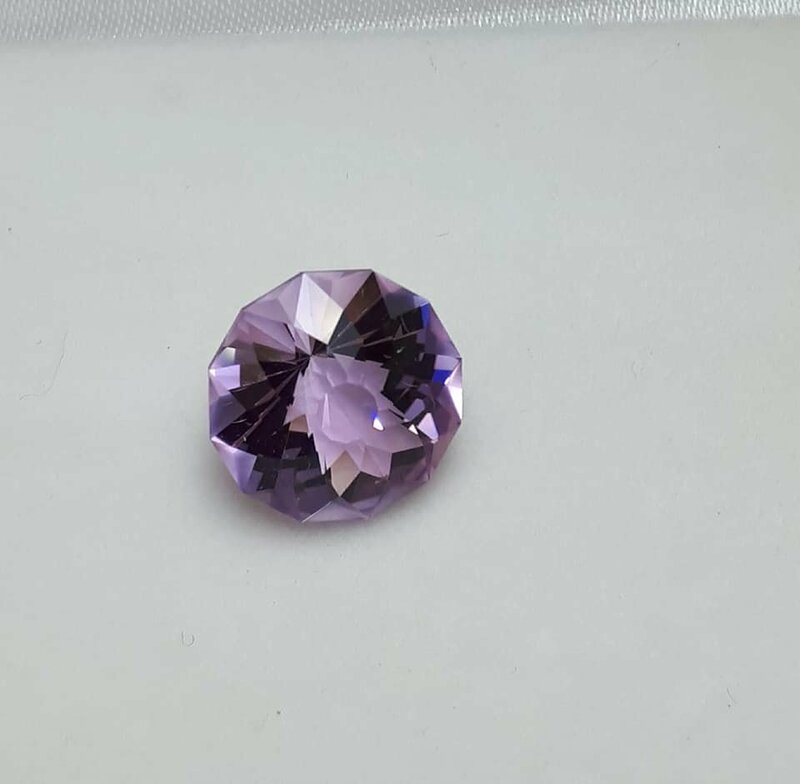 Someone was complaining about it a little while ago on one of the lapidary forums, trying to re-polish a stone for a customer and having trouble because the already-polished surface simply would not behave like a raw, fine cut surface ready for it's first polishing. While there was much to-ing and fro-ing, in the end nearly everyone agreed that polishing seems to create a surface layer with characteristics that are slightly - but noticably enough to cause headaches - different from the underlying material. This isn't really what we would expect if the polish was entirely the result of ultra-fine abrasion by inert particles. For myself, I will happily claim to have actually [i]seen[/i] the so-called Beilby layer, through very powerful loupes, much more powerful than I normally use for lapidary work (dunno why I bought what amounts to a low-powered, hand-held microscope, way in excess of what is needed for faceting but anyway I did). Just like Beilby, who noted a very particular scratch pattern, polished the surface with oxide until a perfect polish was achieved and scratches no longer visible even with magnification -and then etching the surface with acids and recovering [i]the identical scratch pattern[/i] - I have actually seen similar. Seen a particular scratch pattern left by the fine cutting lap and polished the surface with cerium oxide until the scratches were entirely gone. But on close examination with said very powerful loupe, at particualr angles the exact same scratch pattern was still just visible but the scratches now had the appearance of having been "filled in with liquid glass". It really didn't appear that it was just the last vestiges of the original scratches that hadn't quite been removed, there definately seemed to be something filling in the scratches, as though polishing had created an amorphous layer - similar to glass or opal - which had flowed into the scratches and filled them. Just thought I'd chuck that out there :bgrin - this isn't really an issue with metal polishing, there's only two grades in jewellery polishing and both probably do function as fine abrasive (though a precious metal polish called "Rouge" in the jewellery trade is in fact iron oxide). Btw, you can buy all of this stuff for not that much from Bunnings. I have a cheapie Chinese made bench grinder from Bunnings - think it was about $60 - took the grinding wheels off it and replaced them with coarse buff on one side charged with "Tripoli" which is an aggressive pre-polish for metal and the other a soft muslin buff charged with Rouge for the final polish. The adaptors for screwing on the buffs, the polishing compounds - all available from Bunnings. I think this set up would polish a significantly large brass, bronze, silver or copper item [b]very[/b] quickly. It's way more than what I actually need for little items like rings. True, you still won't get right into small, tight corners but if you have a [b]lot[/b] or ornamental metalware, it might be worth looking into. All polish would have some abrasive, Brasso more than Silvo tho. Even toothpaste has some abrasive in it! Some people polish too much, get the nickel showing through on silverplated articles.